A full-color booklet for building your own sheep and goat feeders. It contains instructions and diagrams on how to build Premier‘s Double-sided and Single-sided Feeders. 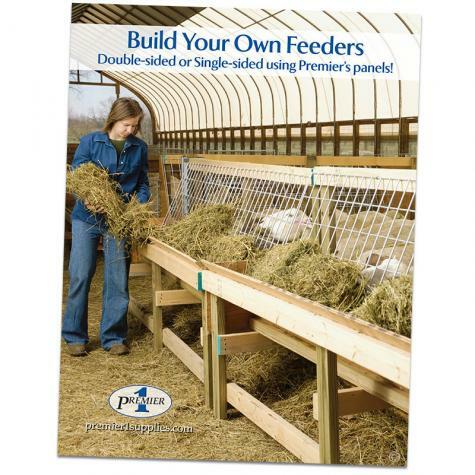 Premier's Build Your Own Feeder Plan Booklet is Free when you purchase our 24" wire panels or 30" wire panels. A printed version of the booklet may be purchased separately, or you can download it below. The design and plans were easy to read and build. The main problem I have is the feeder is too high for my sheep. They can barely reach the feeder. I had to modify and lower it. Just something to consider when building. I have Dorper/Katahdin/Romanov sheep. Would probably be fine for Suffolk or hampshire sheep. Instructions are easy to understand and look as if a beginning carpenter can handle the construction. Easy to read instructions. Simple but sturdy design. Never knew something this durable and efficient was so easy to build, wish I would have ordered these plans a lot sooner. The instruction is clear. Next summer I will built the feeder. good and clear instructions; next summer project so I don't get trampled by my supposedly hungry goats. A little disappointed by the shipping charge, but I would order it again if I needed it.